This granita specifically calls for Comice pears, a variety recognized by its full round body and green skin that oftentimes features a red blush. Its creamy white flesh is custard-like in texture, with abundant sweetness and juice when ripe. This icy granita is light and delicate, yet flush with flavors. The unique flavor profile of the Comice pear truly shines and pairs perfectly with the cardamom spice. 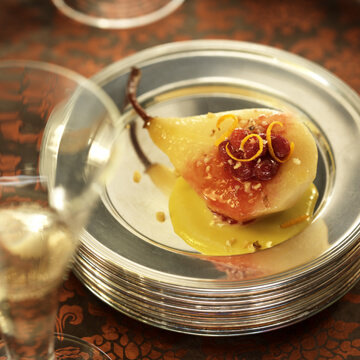 This recipe was created for Pear Bureau Northwest by Chef Hedy Goldsmith of Michael's Genuine Food in Miami, Florida. For granita: Peel, core, and dice the pears into 1-inch cubes. Lightly toast the cardamom pods in a small sauté pan over medium low heat until they smell slightly toasty, about 2 minutes. Cool and lightly crush the outer shells. In a saucepan, combine water, sugar, cardamom pods, vanilla bean seeds and pod, and salt. Bring the mixture to a boil and remove from heat. Let syrup cool and infuse at least 30 minutes. 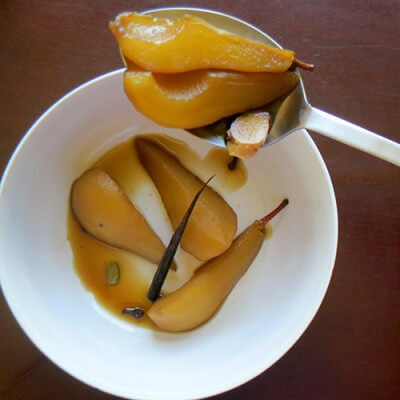 Strain the syrup into a small saucepan, add pears and lemon juice and simmer for 10 to 12 minutes, until soft and translucent. Remove the pan from the heat and let the pears cool in the syrup. When cool, puree the pears and syrup in a blender. Pour the puree into a large bowl, add 3 cups of water, stir well, and allow the mixture to sit overnight in the refrigerator. Strain the mixture through a fine mesh strainer into a 9 x 13-inch pan. Freeze 30 to 45 minutes, then use a fork to scrape the ice crystals that have formed around the edges of the pan into the middle. Repeat this step every 30 minutes or so until the mixture resembles shaved ice. It should take a few hours, scraping about four times. Cover with foil until ready to serve. For biscotti: Make the biscotti between scrapings. Preheat the oven to 325 degrees. Place the sugar in the bowl of an electric mixer or a medium size mixing bowl. Zest the 2 lemons into the sugar. Use your fingers to rub the zest with the sugar; this brings out the citrus oil and coats the sugar. Add the flour, baking powder, salt, and pistachios to the bowl. Mix to incorporate using the paddle attachment on the mixer or your hands. Whisk the eggs, yolk, vanilla, and almond extract together. Add to the dry ingredients and mix on low speed or continue mixing with your hands. The mixture will seem dry at first, but eventually comes together. When that happens, remove the dough from the bowl and form it into a 12-inch by 2 ½-inch wide log on a piece of parchment paper. Place the biscotti log on a baking sheet and bake for 30 minutes total, rotating the pan after 15 minutes. It will spread considerably. Remove the pan from the oven and reduce the temperature to 250 degrees. Once the log has cooled, use a serrated knife to slice it on a slight angle or, for longer biscotti, on a greater angle. Place the slices back on the baking sheet and return to the oven for 20 minutes or so. Rotate the pan after 10 minutes. The second time in the oven dries the cookies and makes them crunchy. Cool to room temperature before storing in an airtight container. Before serving, put martini glasses or wine glasses in the freezer for a few hours. Scrape several spoonfuls of granita into the glass and sprinkle with pomegranate seeds. Top with several more spoonfuls of granita and top with additional seeds and fresh herb leaves. Serve biscotti on the side.